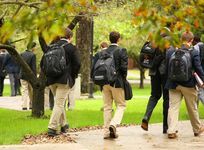 For the 2018-19 school year, there are 8 top college-prep and junior boarding schools located throughout Minnesota, serving 3,639 students. The International School of MN Photo - Entrance to ISM's Residence Hall. Amerigo Twin Cities Cretin-Derham Hall Photo - Cretin-Derham Hall is dedicated to providing students with a premier education and avenues to succeed at the university level and beyond.